Your mission, should you choose to take it. . . Decode the message and communicate the Master Plan to all who will hear. 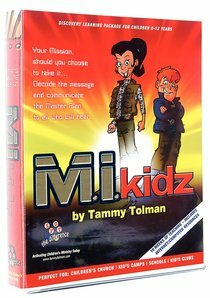 Created by Aussie children's pastor, Tammy Tolman, this discovery learning package for use specifically with kids aged 8-12 includes interactive learning materials, reproducible masters, a CD with 6 songs and backing tracks, temporary tattoos, drama resources, internet downloads and a stack of Bible based fun! About "Mi Kids (Teachers Kit) (Spot The Difference Curriculum Series)"